... or wind that has passed over nearby land making it excessively erratic. Land induced turbulence or rotor can have major gusts, extended lulls making flying a full sized traction kite a lot of work to downright dangerous. Try to use launches with no upwind land mass, trees, buildings, etc. to disturb the wind. If the wind is close to sideshore and is uneven as a result, be extra careful. If it is too uneven, move to a better launch or go some other day when the wind improves. 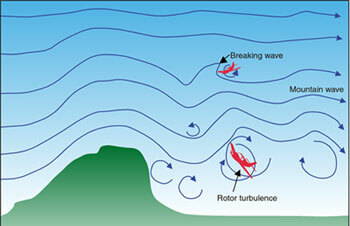 The chaotic winds (rolling or rotoring wind), can mess kiters up, powered aircraft too in some cases. The velocity of the wind and direction can change too much for safe, stable flight. Try not to let wind shadow, "Shadow Blast" you. Last edited by RickI; 02-13-2012 at 09:56 AM. To some degree it is what you are skilled in and used to within limits. In extreme cases it can be a bear for almost anyone. Recently, there have been some fatalities and near fatal accidents caused by rotor. Some were well experienced kiters and all were using flat kites with substantial depowering capacity. It all comes down to LOCATION. If the wind is passing over nearby land before it reaches you, there can be problems. The kite may surge up in gusts, stall and fall like a rock in lulls and you might get yarded in a successive gust. It happens, all too often over the years. If you can move to an area free of rotor, do it. If not, maybe it is a good day to pass on riding. Riders choice, know what to look for and choose well. Winds around and to the left or west of the line are frequently rotored. They can have substantial gusts and lulls. The land and cover are fairly low, residential housing. Still, they are high enough to significantly disturb the wind. Kiters have been severely injured here as a result, one within the last month. This was the scene of a particularly severe lofting. 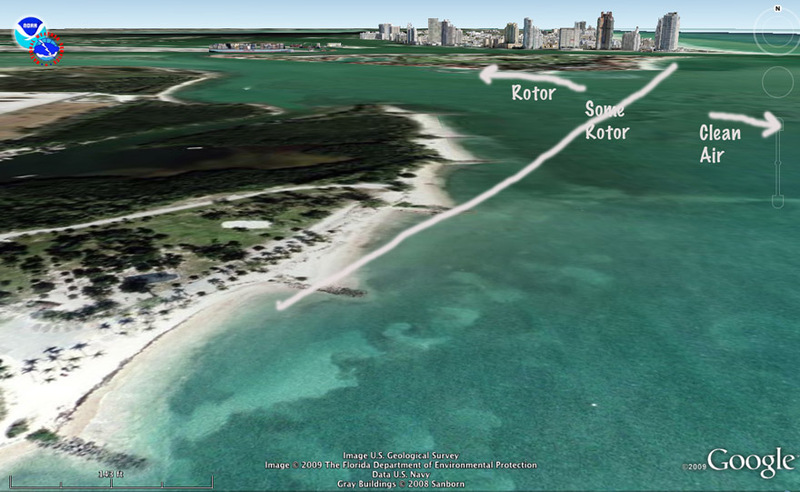 With the land mass to the south rising a few hundred feet off the water and land in most other directions, rotor is common here from most directions. Just a 1/4 mile to the west, there is an area without rotor from some wind directions at least. For kiting, for most winds, this launch is a poor choice. This is the scene of a recent severe lofting. The land rises dozens of feet above the water and with low houses creates enough rotor to dangerously disturb the wind. Not aware of any recent accidents at this location, historically, maybe. 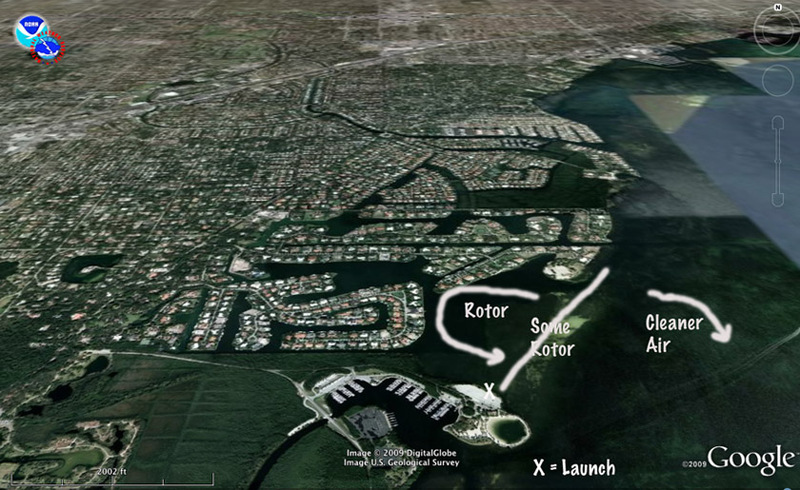 This is a more obvious cause of rotor, large buildings upwind. They could just as easily be a set of dunes, hills, mountains or even a high tree line. Beyond that, there are some famous cases of rotor winds like Mistrals in the Med. A number of messed up kiters in those winds as well, often enough in riders lacking sufficient experience. So, avoid offshore or side off winds with turbulent conditions. Pick a good location for conditions. If it is close to side shore but still turbulent be extra cautious, i.e. avoid flying your kite over head on land it may be better to keep it arched towards/over the water, be ready to sheet out and deal with stalls, etc.. Here's a good point, rotored areas may LACK significant waves making it easier to kite (in some ways, not others), do tricks, etc.. The wind on the other hand can be too unstable despite the wave conditions. Last edited by RickI; 02-17-2009 at 11:28 AM. How far away from the obstruction to you have to be to avoid excessive rotor? I recall something from hang gliding, from Pagen's "Understanding the Sky" perhaps, of distances of 10 to 20 times the height of the obstruction as a rule of thumb, perhaps further. I think higher wind velocities will also stretch this distance out. Horizontal gaps play into this as well. Sometimes they can really boost winds and maintain them and in others make the wind too erratic. The chaotic separation of blobs of color simulates rotor. Imagine trying to keep a kite flying in one direction and above stall speed in that mess. That block could simulate a tree line or building in near side upwind conditions. Rotor can be a bear. In lesser cases it can simply stall your kite in a lull cause it to Hindenberg to the beach, clotheslining anyone standing in the way. How many times have you seen that happen? Pays to keep your kite aloft in clean air, free of much rotor. Last edited by RickI; 02-20-2009 at 09:07 AM. Some more examples of terrain that creates dirty air along with clear zones. In some of the following cases the upwind obstructions are fairly low. As such, the normal issue with close to side shore winds flowing over these lower barriers is avoiding kites stalling, falling like rocks and risking wrapping other kites, cutting people with line. In these cases getting your kite up, over the water and getting out promptly is indicated. As a rule, going in side off winds in these areas isn't feasible. You might get offshore with some effort but the lulls nearshore (within a 1/2 mile or so) will usually see your kite on the water and you swimming your stuff back to shore. In areas with large upwind obstructions, tall buildings, hills, mountains, etc. 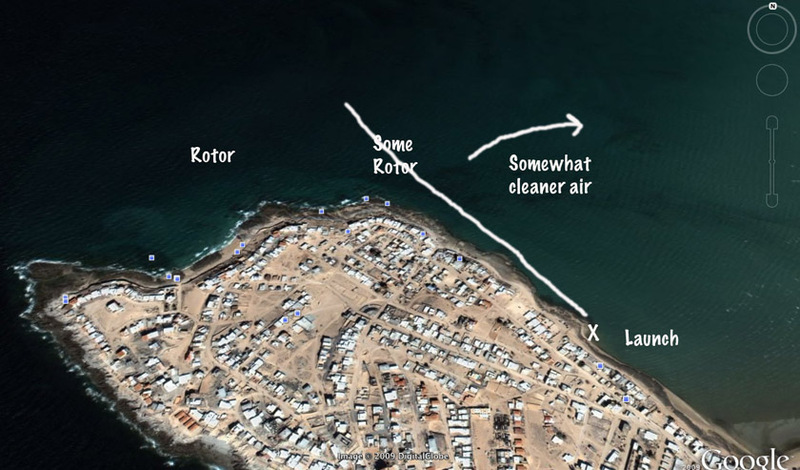 particularly with strong and direction shifting winds the hazards of kiting in rotor go up substantially and feasibility of kiting drops (vanishes?) dramatically. Depending on local conditions the wind shifts in the "some rotor" area may still be too excessive at times. The larger the obstruction and the stronger the winds, the more erratic and potentially hazardous the rotor induced lulls and gusts. In this case given the size of the obstruction, it might be more fair to call "some rotor," "lots of rotor." Here is an example of a low obstruction. It can still easily mess up prospects for staying upwind or easily returning to shore if side off. The quality of wind when it is side shore is lessened as well. Islands often have irregular shorelines, frequent wind obstructing headlands. 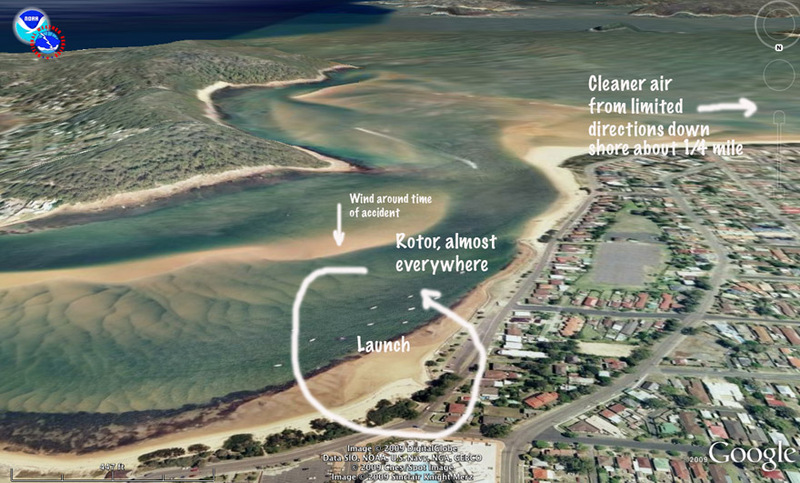 Changing launch locations can make a big difference in the quality of wind on islands. As compared to some parts of Florida where you might travel 50 miles with no significant change in wind direction relative to shore. SE Florida mountains, aka condos. Where you have them there's wind shadow and eddies spinning off the sides downwind. Where there are holes, you can get stronger wind but still uneven, perhaps dramatically so. Where they are bunched together you may have no useable wind. Again, side off in this area generally doesn't work, at least not without a chase boat and a few miles from shore. When it is close to sideshore and shifting over barriers near the water, kite launch, landing and riding can be challenging and even dangerous. The "some rotor" zone is wide in the case due to the island and notch present to windward. The wind direction can shift quite a lot due to eddy effects around these objects. With the shifting the wind can gust and lull substantially making staying upwind, launching and landing tricky and again potentially dangerous. 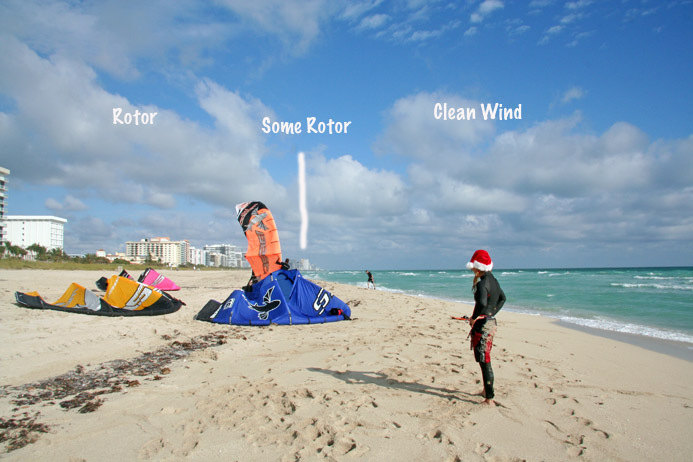 If you are new to kiting, to the area or are just back from being away from the sport for a while, avoiding "some rotor" and definitely "rotor" conditions makes good sense, even more so in stronger winds. There have been too many avoidable injuries related to these causes. I would really like to checkout Portugal, has an incredible coastline. 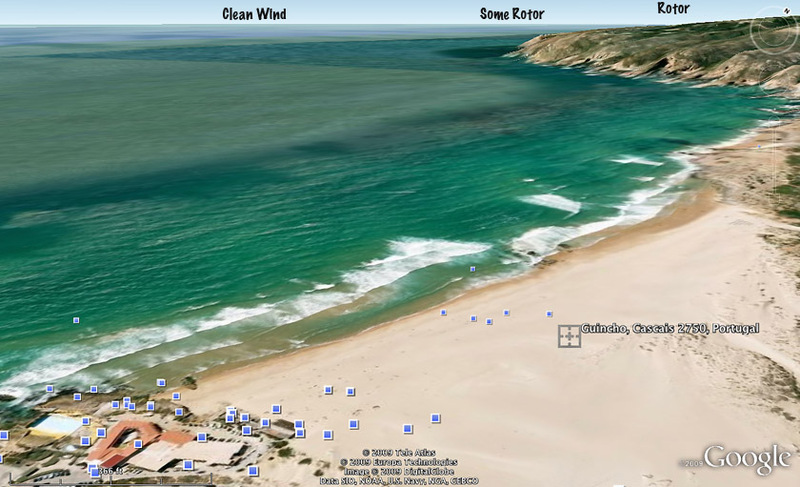 Looking at conditions, I believe you can have some major rotor at Guincho as you say. 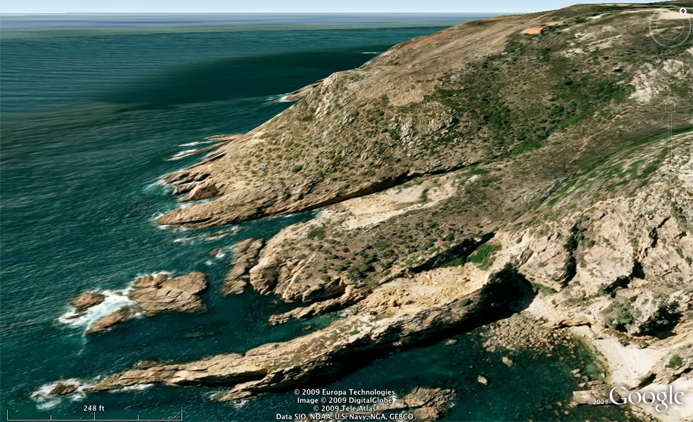 That is the beach at Guincho, it is less than 2.5 miles (about 4 km) from that point of land, Cabo de Rocha. Cabo seems to rise a good distance above the water. 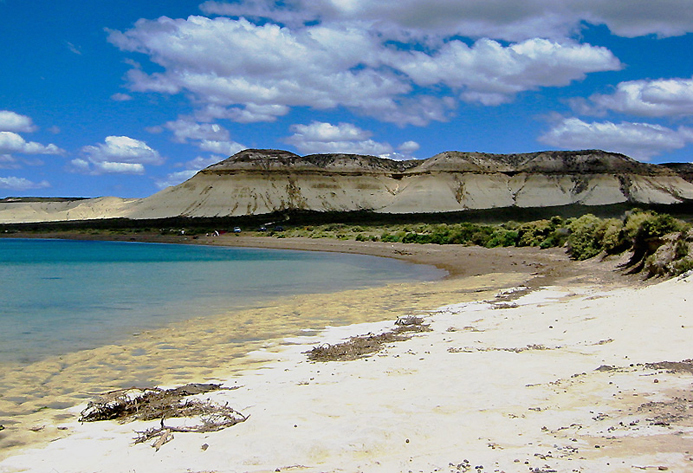 The area is known for a strong wind, the Nortada. I understand it comes out of the N-NW augmented by thermals from the arid hot shore areas rising to around 25 kts. (perhaps as high as 40 kts. ?, not sure about this). The photo is alinged more or less to the NW. If you have a honking strong, likely already gusty wind rotoring and refracting around this high point of land, you can expect some major gusts and lulls. I understand it is a popular spot with windsurfers. They can perhaps deal a bit easier with rotor, gliding through the lulls and sheeting out (or being catapulted!) in the gusts. Kiters either manage or they don't. Sounds like an experts spot with strong local experience when the wind is on and from the N-NW, then add waves! 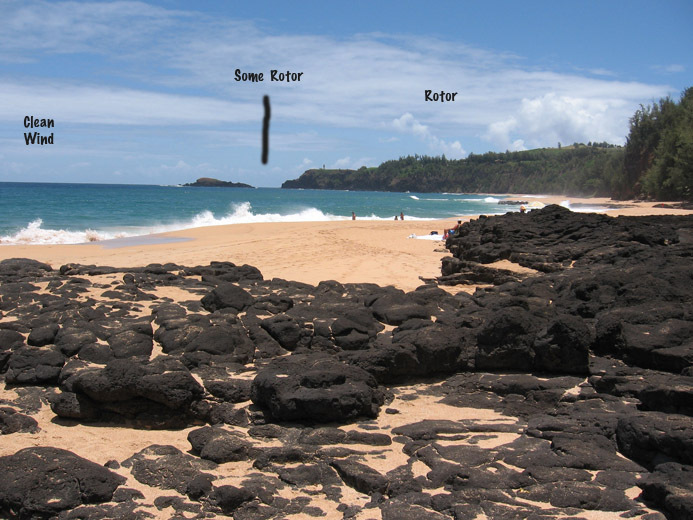 I imagine with strong winds, the "some rotor" zone can be pretty wide with shifting winds. A closer look at Cabo de Rocha, that is a big chunk of rock! 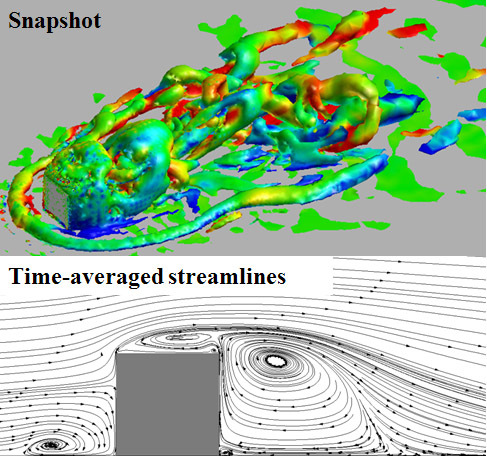 The thing with rotor like rapids over rocks, the faster the flow and higher the obstructions, the more violent and longer the area of turbulence. Some kiters may not know it but they are setting up in some Class 4 (aerial) rapids by analogy. We frequently say this accident or fatality happened due to excessively gusty wind. In some of these cases the excessively gusty wind has been caused or increased by rotor. Riders should routinely scope this out when evaluating the launch of the day. Who else has rotor at their spot, when, why and how do they deal with it? Any interesting stories come to mind? Here's another example of serious rotor from a couple of years back. 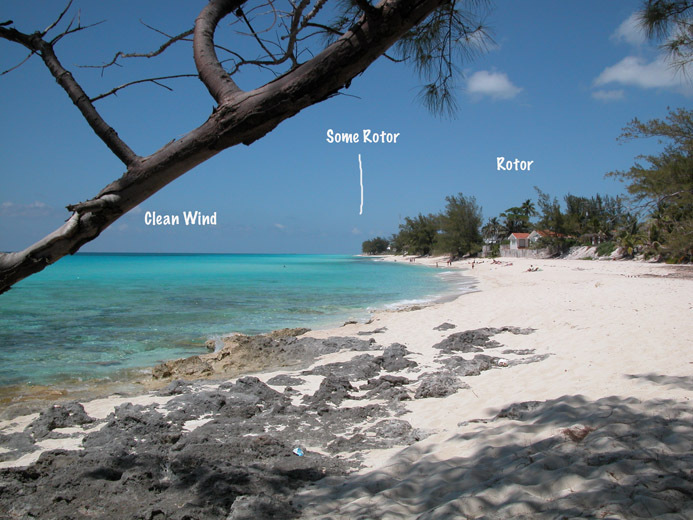 Again, this is known as a windsurfing spot, kiters go elsewhere. 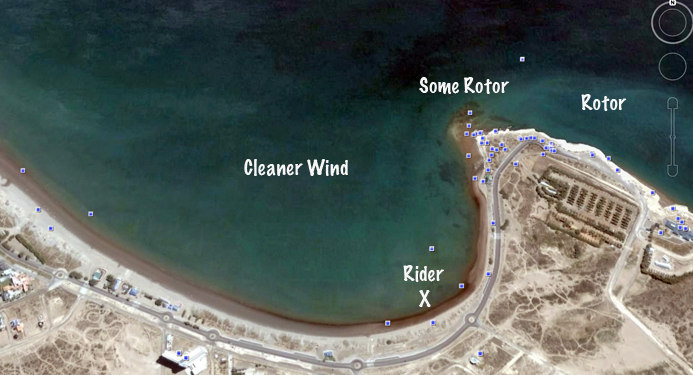 Windsurfers may be able to manage excessive rotor a bit better. At least they may be able to glide through the lulls. In gusts hopefully suffer nothing worse than to get spun 20 ft. away from their rig across the water in a catapult. In strong winds, this embayment seems like it would turn into a blender of cascading wind. If you are standing there, the wind would die down to almost nothing for seconds, then boost up a bit, then perhaps rage down at high speed, then ebb or die and repeat. The direction of the wind might change as well, perhaps a lot. Look at the colored blobby diagram on the first page. I assume the colors represent various velocity ranges. Thing is where there is no color, there is no significant wind, dead lull shifting perhaps to honking strong in a red zone. The mess whirls all over the place continuously. Pretty much anything east of north going clockwise up to around north west will be rotored in this bay. The rider was from out of the area, and apparently didn't fully appreciate hazardous conditions at this spot. 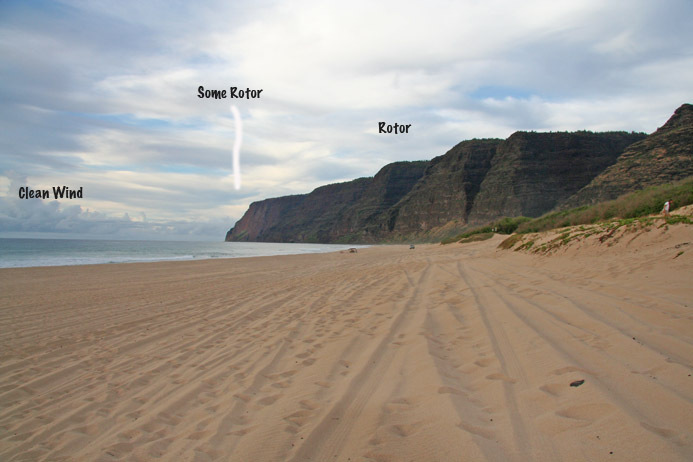 Reportedly he was warned that this area wasn't a good choice for kiting by a local. He had been in around 12 kts. winds, kited upwind nearer to the rocks of the point. He was reportedly hit by a strong gust and lofted about 45 ft. high and fell into about 8 inches of water. He didn't survive the impact. Location is real important. 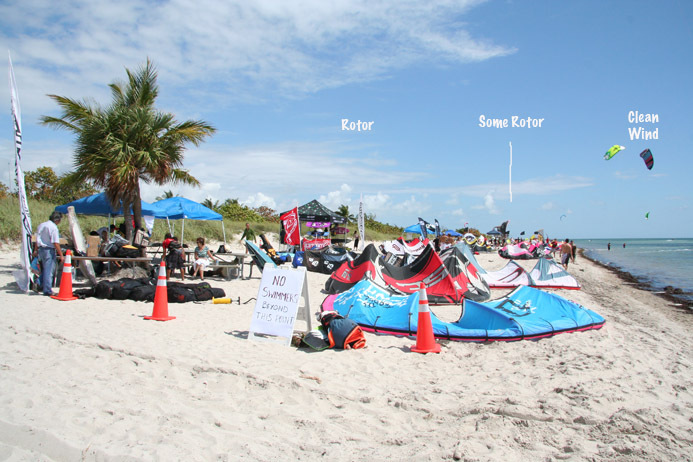 Kiters should learn what to look for and avoid particularly if they are new to an area. Question, do some instructors teach this stuff along with other location selection considerations? I hope the days of focusing on the kiting setup, waterstarting and other basics alone are well in the past.